Oatmeal muffins. 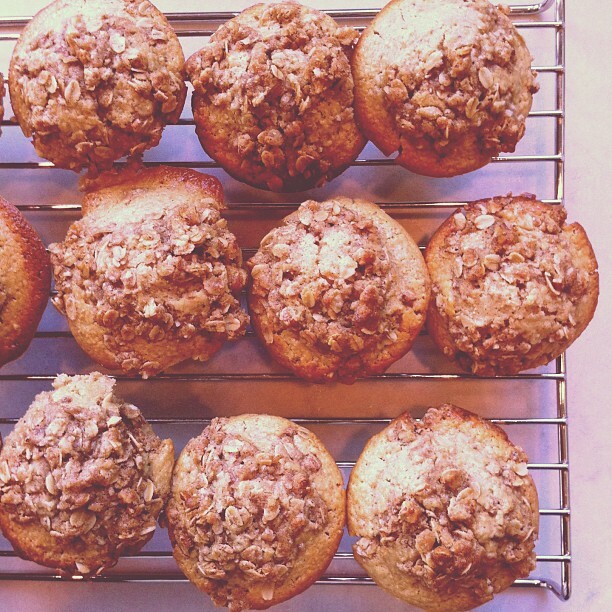 Really good oatmeal muffins. Hearty without being heavy, satisfying without being too sweet, and impressive without being too difficult. Try them! 1. Topping: Combine oats, flour, pecans, sugar, cinnamon, and salt in medium bowl. Drizzle melted butter over mixture and stir to thoroughly combine; set aside. 2. Muffins: Grease and flour 12-cup muffin tin. Melt 2 tbsp butter in 10-inch skillet over medium heat. Add oats and cook, stirring frequently, until oats turn golden brown and smell of cooking popcorn, 6-8 minutes. Transfer oats to food processor and process into fine meal, about 30 seconds. Add flour, salt, baking powder, and baking soda to oats and pulse until combined, about 3 pulses. 3. Stir 6 tbsp melted butter and sugar together in large bowl until smooth. Add milk and eggs and whisk until smooth. Using whisk, gently fold half of oat mixture into wet ingredients, tapping whisk against side of bowl to release clumps. * Add remaining oat mixture and continue to fold with whisk until no streaks of flour remain. Set aside batter for 20 minutes to thicken. Meanwhile, adjust oven rack to middle position and heat oven to 375 degrees. 4. Scoop 1/2 cup batter into each prepared muffin cup; they'll be filled to the rim. Evenly sprinkle topping over muffins (about 2 tbsp per muffin). Bake until toothpick inserted in center comes out clean, 18-25 minutes, rotating muffin tin halfway through baking. 5. Let muffins cool in muffin tin on wire rack for 10 minutes. Remove muffins from tin and serve or let cool completely before serving. *This method reduces lumps (that all oats tend to form, even finely ground oats) without overworking the starch and gluten, which would toughen the crumb.